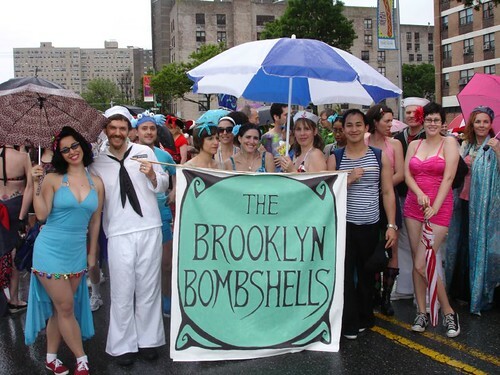 OMG the Brooklyn Bombshells won the 2009 Mermaid Parade (again)!!! 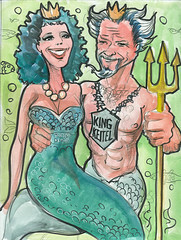 I just got word that my group the Brooklyn Bombshell Revue won, yet again, the Coney Island Mermaid Parade! Specifically, we got the Judge's Choice Award, with the additional note "might the winningest folks in Parade history — custom art bribes work!". 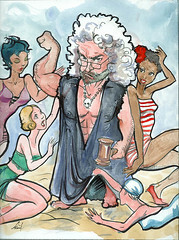 The art bribes they refer to are these awesome caricatures drawn by our own Michael Blank. Congrats all around to our lead organizer Miss Behave, our choreographer Lilieblue, the five couples who braved the weather to perform the routine, and the rest of the swingers who turned out to march with us!